Hello, dear students! Hope your exam was fine. 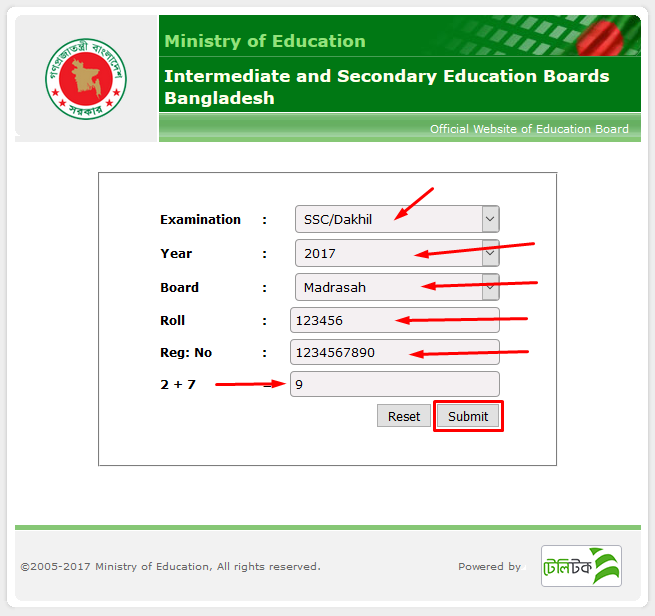 In this article, I am going to share Dakhil Result 2017 for Madrasah Education Board of Bangladesh. Dakhil is the another program of Madrasah student. Before attending Dakhil exam, every student must need to complete class 9 and class 10 under the Madrasah Board. This is the same level program of Secondary School Certificate. It is another biggest public examination in Bangladesh of Madrasah board. Now select "SSC/Dakhil" from Examination option. Now select "2017" from Year option. After that select "Madrasah" from Board option. Then type your Roll and Registration Number and type security math. Then hit on Submit button. Wait few seconds. Your result will appear on another page. You should check below screenshot. Example: DAKHIL<space>MAD<space>123456<space>2017 send to 16222.